Let’s say we have an application where we want to dispense gift cards to select users. Administrators can manage an inventory of gift cards and then invite users to claim them by filling out a form at a tokenized link. Different validation rules apply in different contexts. In the admin-editing context (which we’ll consider the default context) the record is valid so long as it has a code. In the user-claiming scenario, the gift card is only valid if it has been assigned a name, email and the user has supplied a valid confirmation of its token. errors[:base] << "You are not authorized to claim this gift card"
The beauty of validation contexts for use cases like we have here is how declarative and readable they are and how foolproof they become once we’re further up in the stack. To drive this point home, let’s have a look at how skinny the controller and UI layers we build around this model to handle the full user flow are. 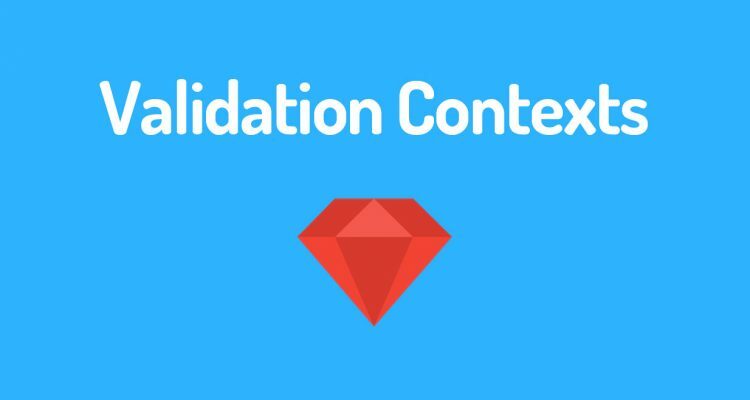 It is worth noting that as of Rails 4.1, the on option to validate/validates can now take multiple contexts. This is welcome flexibility and in my opinion even further reduces the number of real-world use cases for heavyweight solutions like state_machine.